TARJA: ACT I – the first solo live audio and video product in Tarja’s rock outfit. NEW track and 1st single “Into The Sun” digitally available Friday, July 13th! 2012 saw the ‘What Lies Beneath’ world tour finally draw to a close, and Tarja disappearing into the studio with a new album already up her sleeve. To shorten the wait, she had planned a live DVD of her own, this one an ambitious undertaking, filmed with no less than ten HD cameras, over the course of two full length concerts that took place in the majestic El Circulo Theatre in Rosario, Argentina. A throwback to her classical roots, the DVD was aptly titled, ‘Act I’. Tarja will release her first solo live audio and video product in her rock outfit on August 24th. There is a 2CD version available as well as the 2DVD video format and a Blu-Ray of the concert. Via Pledge, fans can purchase a very special and limited 80 and more pages photobook (including 3 – ! – DVDs and 2 CDs), a rare and limited vinyl version of the product plus many personalized Tarja gimmicks and clothing items. The photobook (also referred to as “mediabook”) features one full exclusive concert which cannot be purchased anywhere else than in this mediabook. Whoever does subcribe to Tarja’s newsletter at www.tarja-act1.comuntil August 5th, will receive the live track “In For A Kill” for free the day after, on August 6th! So worth checking it! Says Tarja: “Those two nights in Rosario were truly magical to me personally. I was excited to finally film and record my first live rock DVD. This DVD shows you how great is my relationship with my fans. They have been extremely supportive throughout the years and on this release they play a big role”. 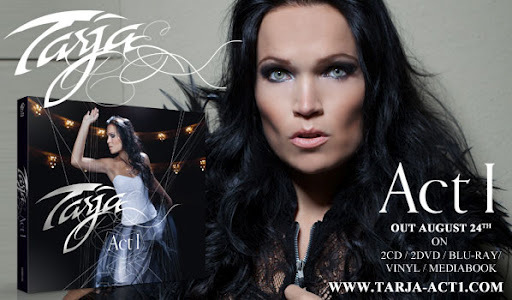 At www.tarja-act1.comfans receive first insight on the product, Tarja frequently communicates with her fans and updates her followers on the process in the Pledge campaign, the live product, etc.